We're having a little fun with mixed fruit for this week's Tuesdays with Dorie! And wouldn't you know it that I picked the same mixture of mixed fruit as this weeks hostess! 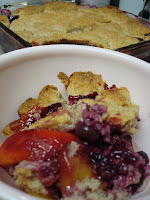 Beth, who is the wonderful creator of Our Sweet Life chose to make Dorie's Mixed Berry Cobbler. 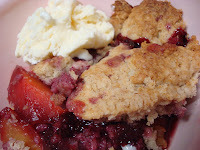 And what better dessert says summertime like cobbler? This recipe was so easy to put together, because it's all based around frozen fruit, and seeing as how I am a huge fan of frozen fruit, my freezer was packed with plenty of options. I don't know what it is about the mixture of peaches and blueberries that always gets my heart...and stomach...pumping, but it does! So of course I grabbed those two fruits right away. It wasn't until I lifted up my frozen bag of peaches that I saw the little leftover bag of frozen blackberries peeking out at me. I figured that the addition of these deep purple-y sweet fruits couldn't hurt the cause, so I pulled that bag out as well. I also wanted to give me crust a little bit more of a homey flavor, so I added cinnamon and nutmeg to my batter...awesome choice! After about 25 minutes of baking my house was smelling so amazing. Andy came home half way through the baking time and about died when he stepped in through the door. "What are you making? And is it ready for me to eat? ", were the first two questions out of his mouth. And I must say, despite some other baker's complaints about the recipe, I found it to be a very delicious, easy and comforting dessert to turn to. Dolloped with a big scoop of vanilla ice cream, this dessert totally made my night! All those berries just waiting for you in the freezer? You're a smart cookie. I want to "accidentally" come upon a bag of frozen blackberries! Lucky you! Oh, these look gooooood. great job, as usual!! Looks so good! Great job! I wish my freezer was as packed as yours! Wonderful fruit combination - I love peaches. The best thing (well... one of the best things) about this week's assignment was the way it smelled in the oven. Great job! 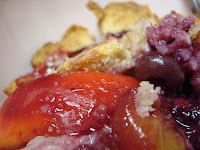 I haven't put peaches and blueberries together in a dessert, but I'm going to after reading your post! I'm glad that you liked the recipe! The cobbler is looking good, and great job on finding those blackberries!